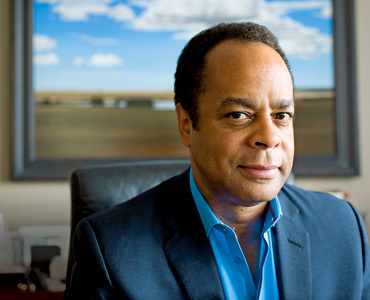 EUR Special Report: Who Were the 10 Richest Black Americans in 2010? *It is widely known that the wealthiest Black person in America is television talk-show diva Oprah Winfrey. No one else even comes close. Winfrey had reached a net worth of $2.7 billion. However, culling information from a variety of sources, we conclude that the recession was not kind to Winfrey and she finished 2010 with wealth between $2.4 billion and $2.5 billion. Despite a disastrous year in golf and a divorce, second place still goes to golfer Tiger Woods. However, Woods was projected to have reached billionaire status this year. It did not happen. We estimate Woods lost $200 million in endorsement money due to his much publicized infidelities and that he settled with his ex-wife for roughly $100 million leaving him with a net worth of somewhere between $650 million and $700 million. The third richest Black person in America is most probably former basketball great Earvin “Magic” Johnson. Johnson’s wealth has come mostly from restaurants, movie theaters and real estate. Johnson did not really have a fantastic year in 2010 but the two of the Blacks who were richer simply had worse years. We place Johnson’s wealth at $500 million. The number four position goes to another former basketball great turned entrepreneur Michael Jordan. Jordan still pulls in major endorsement money. In addition, he had sufficient bank to be part of the deal which purchased the Charlotte Bobcats of the NBA from BET founder Bob Johnson. Jordan has estimated wealth of $475 million. The fifth richest Black person in America is Black Entertainment Television founder Bob Johnson – the nation’s first Black billionaire. Johnson walked away with a bundle when he sold BET to media giant Viacom. But a substantial portion of that money went to his ex-wife Sheila Johnson. In addition, Johnson’s venture into sports franchises proved a financial mistake. He lost substantially with the Charlotte Bobcats. He is now focusing almost entirely on real estate and the hotel industry. His wealth currently stands at around $450 million. #9 – The legendary Barry Gordy is Black America’s ninth richest person. The 80-year-old sold Motown Records Company in 1988 for $61 million and since became involved in movies and other entertainment ventures building an estimated wealth of $320 million. #10 – The top ten is rounded out by another real estate giant: Chicago’s Quintin Primo III. The 57-year-old Harvard business school graduate has wealth of $300 million. Now can you imagine if all these black folks pool their billions and open a national black bank. Somewhere where black folks will always get a decent home loan, and don’t have to settle for some sub-prime mess from a loan shark like Wells Fargo, then end up losing the home through foreclosure, anyway. And while they are at it, get into car dealerships too. So that the two most major investments that blk ppl invests in won’t end up taking them to the cleaners. OK, #7 – Sheila Johnson – ex-wife of BET founder Bob Johnson and owner of the Washington Mystics of the WNBA – $400 million. But a substantial portion of that money went to his ex-wife Sheila Johnson. So the woman going to get hers, regardless. Now y’all see why Puffy still ain’t married. I don’t agree. Rich black people don’t OWE the rest of us anything. If some black people want to stop being taken to the cleaners during financial transactions, then they need to stop trying to live beyond their means to impress people, become financially literate, and correct the bad financial behaviors they’ve developed over the years. Being financially literate is one thing, but just being black puts you at a higher risk of being taken advantage of by the banks. Blacks were particularly targeted for subprime loans, and most of these folks thought this was their only option to getting a home loan. And absent a black bank, maybe it was. It’s also no secret that getting any type of financial assistance is harder, being black. Which brings up the next reason why we need a black bank funded by blacks. We suffer loan denial at a much higher rate than anyone else, even with the same credit score. Why do you think there are so few black business? Having a black bank would certainly address this inequity. But no matter how “financially literate” you are, as long as you have to deal with the man, you will fall victim to the black tax. Maybe one day the black tax will be eliminated, but I know that it doesn’t stop us from achieving, completely. We may have the black tax, but other groups have their trials as well. We are not special. Everybody has a cross to bear, and I don’t feel sorry, or bad, for people who make bad decisions due to a lack of financial literacy and discipline – especially when all the information needed is freely available just for the asking. If things were 100% like you say, there wouldn’t be ANY black people succeeding and/or getting loans and homes with prime rates. That’s not the case, so what makes those people different from others? WHY does being black put you at a higher risk of being taken advantage of? It fo’ sho’ is not because of the color of the skin. It would be because many black folk have shown that they are not educated about being a consumer of goods and services. THAT is why companies like Matrix targeted churches like New Birth. That was a two-fer. Many folks automatically trust anything related to church and to be a Black church on top of it? BAM. Yes there is racism around but not everything is about our color. So sorry to inform ya’ll of that. We’s ain’t considered that important…….anymore. Shirley Sherrod said it best. The issue at hand is not about color, it was about being poor. I add uneducated on top of that. The subprime lenders (which consist of almost all banks) targeted ANYONE that they could get to sign mortgage papers…….regardless of color or income. However, it negatively affected the financial illiterate. Black folk are only approx. 13% of the population. We did not buy in such numbers that it caused this real estate collapse. That is something you can take to the bank…..and cash. @Shoelover – Who is this “y’all” you’re referring to? I don’t agree with Reds, and I said some of the same things you said, so don’t lump me in with him. If y’all want to bury your heads in the sand about banks targeting blacks or the phenomena of the black tax, then go ahead. But it’s not a myth, at least not anymore. The first time I heard about the term black tax, was on some dateline NBC type show. They had blacks and whites posing as car buyers to see what rates and other unnecessary charges the dealer would levy. And it clearly showed that just being black put you at a disadvantage. Now as far as banks being more likely to take advantage of you if you are black, data coming from the recent sub-prime meltdown proves that is no longer a myth. Google it and you can see all the articles where loan officers are coming forward admitting that Wells Fargo’s subprime loans , for example, were blatantly racist. There are a number of state attorney generals suing them and other banks based on this racist practice. I can only speak for myself, and believe me that my head is not buried in the sand. I never said that the things you’re talking about didn’t happen. I openly acknowledged that they do. But, where you and I differ on the subject is that you SEEM to believe that the black tax accounts for most – if not all – of the reasons why so many black people ended up on the bottom of the pile when the housing market tanked. My position is that the black tax (in the practice of redlining as well as outright discrimination) DID play a part – and maybe a significant part – in what happened, but I don’t believe that it was the sole cause, or the major cause, of so many black people defaulting on their home loans. At some point people have to stop being victims, stop blaming their situations on everybody but themselves, and take responsibility for their choices. They had a CHOICE. If many of those people had been financially literate, AND knowledgeable about the home buying and mortgage process, at the time they were mortgage hunting, they would have recognized when they were being targeted by predatory lenders – and they could have WALKED AWAY, waited, and kept looking until they found fair rates and terms. But, in too many cases, that didn’t happen. So, while I don’t deny that redlining and predatory lending is happening, and is responsible for some of this mess, I’m not willing to put all the blame on the banks and finance companies. Some of the blame belongs on the now former homeowners. If people weren’t desperate for mortgages, and took the first loan they were approved for, regardless of the rates and terms, there would NOT be a market for predatory lenders. Why is Tiger Woods on this list? This man does not consider himself black. Acknowledging that he has black ancestry is NOT the same thing as regarding himself a black man. When are we going to STOP claiming people who don’t claim us? There are plenty of African American banks around that we can join and get services. They don’t have to be National. But that said, even our banks must conduct sound business…..so they can stay in business. I was going to make that same point in my original reply, but I thought I’d be pretty much talking to a brick wall. Reds seems to have his mind made up pretty well, and I thought it would be a waste of time to make the point. But, I completely agree with you. I am aware that there are minority owned banks, but Maxine Waters’ recent trumped up ethics charges prove why we need a larger more stable nationwide black owned bank. In her effort to ensure that stimulus money would go to these minority owned banks and not just the larger ones like Wells Fargo who rob us blind every day, she end up catching a charge. A large stable bank, backed by these billionaire high rollers, which is properly managed, would be able to more easily withstand hard times. And it’s also a myth that black people are more financially irresponsible than anyone else. Acquiring a loan is a complex undertaking, and for the average person, you are basically left up to the honesty of the loan officer. Being black also put you at a higher rate of defaulting because not only will the rate be more likely higher, but you are more likely to get laid off, and carrying more debt from the said black taxes. Blacks will generally end up getting the worst loans because of the document racist practices that banks employ when dealing with us. So what are we going to do about it? Getting our own bank is a start, but making those banks more financially stable is another. There is strength in numbers. @Reds – Oneunitedbank is still in business and Maxine’s issues are what they are……trumped up POLITICAL machinery disguised as making anyone BLACK look bad in an OBAMA administration. (Actually, I think Rangel was the main target, making it a two-fer, but time will tell) Anywho, if any of the machines want to go after a Black Bank, it is not going to matter how many Black high rollers are backing it up. They will go after the Bank or the high rollers themselves. Period. It is a fallacy to think otherwise, and dare I say, young thinkin’ that will make someone think otherwise. I do agree that it is a myth that black people are more financially irresponsible than others. However, on the flip side, black folks are more extremist. Meaning….. We either are very distrustful, too trustful, too ignorant or too intelligent for our own good. Those that exceed have a respect for all four and an instinct to use all when the situation demands it. Again, what are you talking about? For anyone reading this – Acquiring a loan is not complex. It is quite easy. The complexity comes in knowing when you are in the right situation, regardless of the economy, to buy…….anything. A loan officer has nothing to do with that. How you do fix that? You READ, LISTEN, PAY ATTENTION, RESEARCH and LEARN about interest rates, mortgage loans, PITI, BUDGETS and emergency funds. You pay attention to what is happening at the job. You research communities and real estate agents. Basically, you do not walk, call or in anyway contact a loan officer if your ish is not together. i.e. if you are 1 to 4 paychecks away from being late on your bills. You have to SACRIFICE to get your personal finances in order. Getting understanding and knowledge of how things work is what needs to be worked on. Getting rid of the need to keep up with the Jones’ is another. Knowledge is power. And knowing how to use it is what will get us ahead in the finance game. Not stable banks. @Rosalinonline – You asked who my comment was directed toward……..I was responding to Reds – our comments are the same color so that means Reds had two comments. “Ya’ll” meant Reds, and everyone who thinks like Reds. @Reds – The term black tax has been defined in many ways – but I would say that the scenario you described first hearing about it is more of discrimination. Whatever news broadcast that used that term, IMHO, was trying to not call the spade a spade. When many people hear the term ‘Black Tax’, it is normally in the context of having to work twice as hard and know twice as much to get to the same block as a YT counterpart. I have been limiting my posts here because……many of you don’t get it, don’t want to get it and it makes me mad to read these crazy azz posts. We will perish for a lack of knowledge………. So if for some unknown reason, you have not begun to save up some cash for either situation, then should begin to do so………now. That said…… you begin to look for a car. If you are like most folks, you automatically say to yourself that you don’t want to spend a lot of money for a car so you are not going to buy new, you will buy used. Besides, EVERYONE knows that new vehicles depreciate as soon as they leave the car lot, right? Well they do. So you go used car hunting……….and you find used cars are not as cheap as you thought they would be. WHY? Because if you learn about economics and inflation, what goes up (inflation), must come down (recession) and when they stay down it is a depression. Consumer demand does the same thing with prices. Consumers buy a lot of something that is cheap, the inventory goes down, which makes the prices of the inventory go UP. That is what has/is happening with used cars. On the flip side, because everyone is buying used cars, guess what is happening with new cars? Inventory is high, so they go on sale, i.e. prices go down. You can find a used and new cars within a few thousand of each other. And have better luck negotiating the price on the new car. Now apply that logic to the real estate market, gas prices, etc. And note….companies are not above manipulating the consumer to think otherwise. (i.e. the new “report” that gas will reach $5 by 2012) THAT is when the healthy dose of being very distrustful should kick in. Seven or so years ago when prices where going up for homes, everyone who wanted to make money tried to take advantage of inflation. Subprime lenders materialized, regular banks seeing their mortgages fleeing bought these lenders or bought the loans…..to sell within a week to another lender. Consumers who wanted a home tried to buy with no money, Investors bought more property to rent or flip, and homeowners who owned their homes either borrowed against their home, sold their home for an even bigger house or bought a second/third/fourth home. That is why houses were selling for so much. And guess what? The more debt we have, the more we demand in wages and salary. But when prices drop……how many ways can companies drop payroll? Hopefully, Prayerfully, this will reach someone’s brain and stick. So that when I say that Obama can not legislate greed or when you think about unemployment, you’ll start to get it. And Black folk refuse to learn and more importantly are so risk adverse that it is hard to fully take advantage of the markets as they shift decade by decade. …….much less teach our children. Amen, Amen, and Amen for all 3 of your follow up posts! Do you have a blog or a website? I’m right with you, but you broke it down much better than I would have been able to do. I used to be there, but not anymore. I pay enough attention to this stuff not be ignorant, but that’s it. I became disabled, and limited to a fixed income, a few years ago and 99% of this stuff doesn’t apply to me anymore. I’m not a contender, anymore, so there is no reason for me to stay as versed in this stuff as I used to be. If things change, I’ll prepare and get back up to speed. But, I’m all about trying to survive Lupus right now, and I try to avoid anything that agitates me too much, and this is one of those topics. I had to tune out and turn off, to a large extent, for my own good.